Cook noodles according to package instructions. Drain and put aside. In a small bowl, combine the ingredients for the dressing. Mix until it is well blended. If necessary, heat peanut butter in microwave for a 10 seconds so that it is easier to incorporate. Slice all the vegetables, slicing as thin as possible with a sharp knife. Cut the green pepper strips in half. Place half the noodles in a serving dish. Cover with vegetables and mix. Add the remaining noodles and mix, once again. 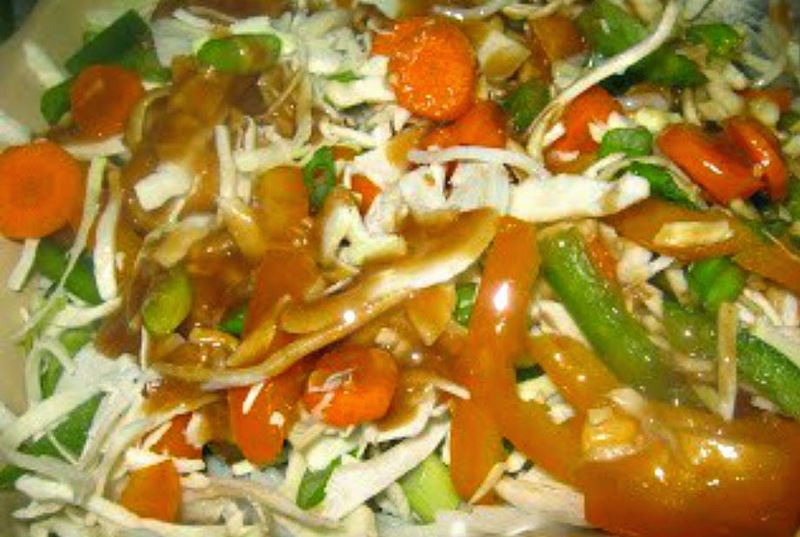 Pour dressing over and mix well enough to coat the noodles and vegetables. Sit down and feast on the flavors and the crispy vegetables. The peanut butter dressing looks wonderful, Chaya! Oh, this does sound so good, Chaya! I really do like the dressing ingredients. There's nothing like a fresh and delicious salad like this. Thank you for sharing it with us at the Hearth and Soul hop. Yum! It looks so wonderfully flavorful!